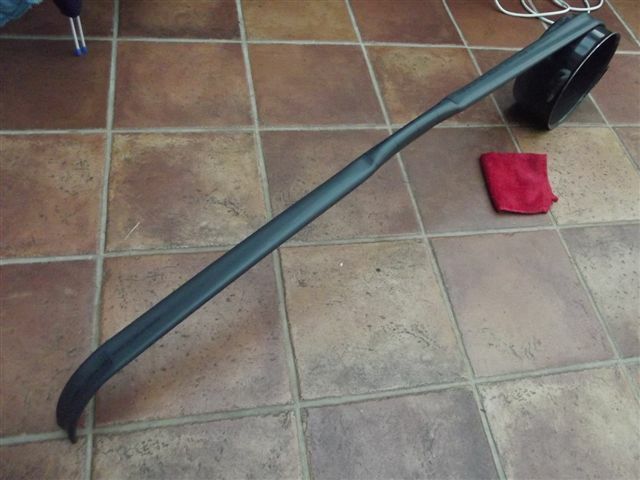 Using PVC pipe to make a bow is not very prehistoric in any way but will make a cheap and fun bow without any real tedious tillering, they are vitually indestructable and waterproof. If one limb collapses you can just heat it up again and reshape although this is best done before painting. 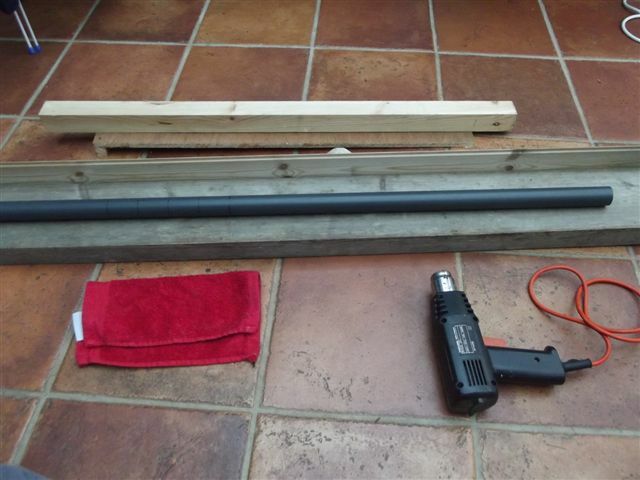 You can get schedule 40 pipe in the UK but it is far too expensive, so I've used 1 inch Class E or PN15 which has wall thickness of only 2.5mm but will make a bow that will pull around 25 pounds, Alternatively you can get 1 inch class 7 pipe which has a wall thickness of 5mm. I odered some of this from a local pipe centre and they had it delivered and then couldn't find the pipe when I whent to pick it up! So I've not had the experience of making a more robust bow. " />So here we have heat gun, plank of wood to squish the bow limb on, a flannel and the tapering jig which is a bit of old plywood with two 1 inch high blocks glued on and a piece of pine to reinforce the ply and stop it from bending. This should have been made from a plank, but this was all I had! 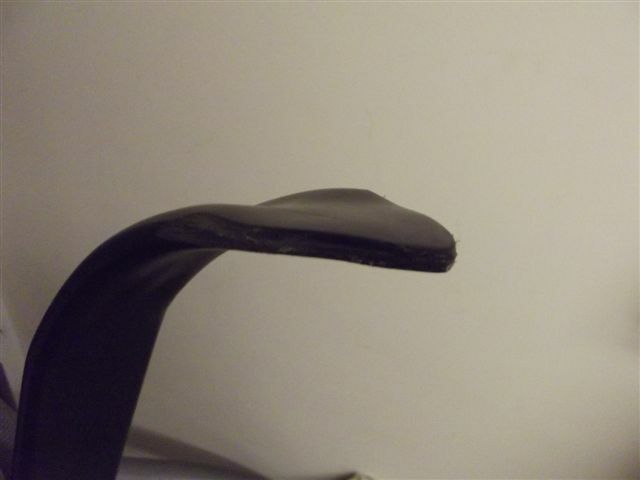 Heat one limb at a time making sure not to overheat any one part and when the plastic gets really floppy get the top flattening jig and line it up to the handle marks and kneel on it for a few mins untill it cools right down. Here both limbs have been flattened. 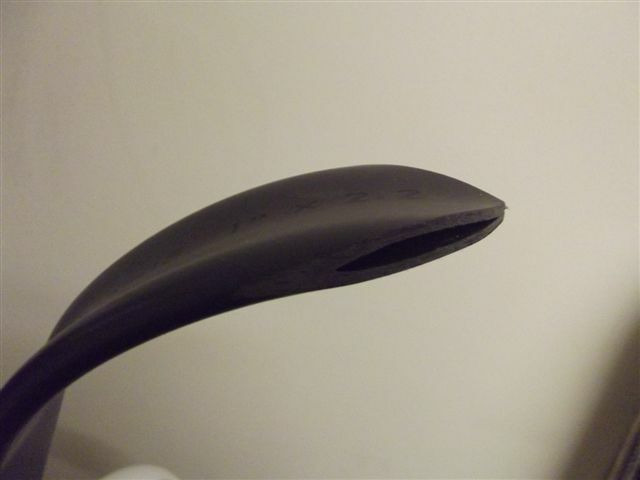 The tips where marked out to 6 inches and this part was heated and pressed around the cooking pot to make some recurved tips. from Wickes for a fiver. Got the idea from this vid. Not quite the heat sculptured prehistoric beauty you made, more a Mary Rose longbow. Heat up one side and open up, then sand the inside surfaces to form a key for some hot glue, this should state on the packaging that it will glue PVC and be relatively cheap. 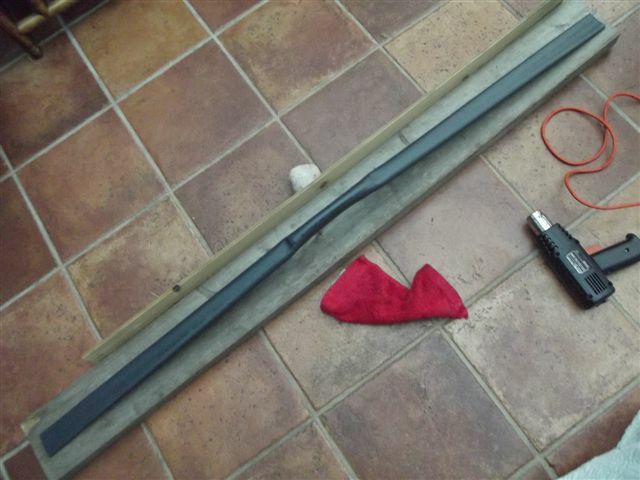 Just use the stick with no gun and heat with the paint stripper heater and smear liberally inside. 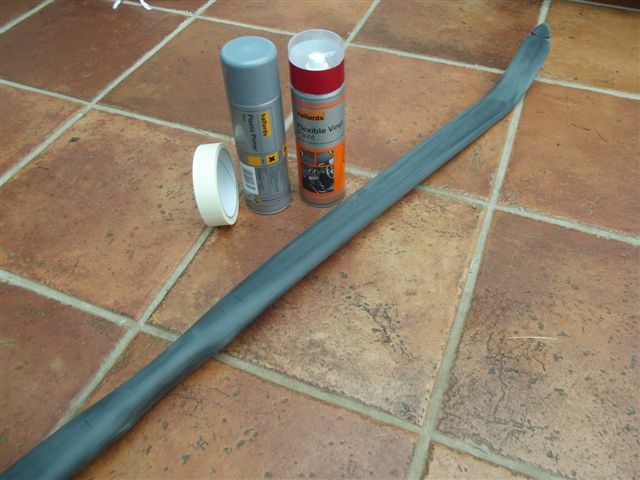 Nocks filed and the whole thing finely sanded for painting, use PVC (or "plastic") paint straight from the can; or like in this pic seal with halfords plastic primer first and then spray. Any idea of the pull weight? Also you seem to have a new business there. they look very smart - great work. He he, thanks. The red one pulls 25Ib and the green with the slightly longer non-bending handle pulls 27Ib so they are not likely to pull your arm off! Good fun back garden twangers I'd say. I'll chase up the thicker class 7 pipe and see what that can do at some point. would a thinner pipe inside a thicker one work? Yes, although getting a good fit is a problem, the one inch sizing is the internal diameter so the outside diameter varies according to the class of pipe, There is loads of clips on youtube from the "backyard bowyer", Nick Tomihammer who it seems invented these bows, but they are using different grades of pipe that you cannot get over here unless you want to part with £50 for an oversized bit of plastic macaroni. 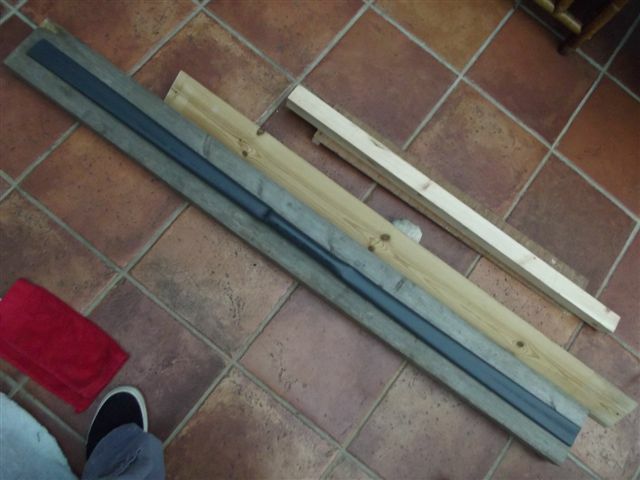 I have made one bow in the same style as the bows above from 1" pipe and it pulls a whopping 50 Ib! Next time I'll get some 3/4" pipe and try some wood siyahs for the bow tips. The delivery was very quick from the stockist and I have nothing to complain about, also they sell at a reasonable price. 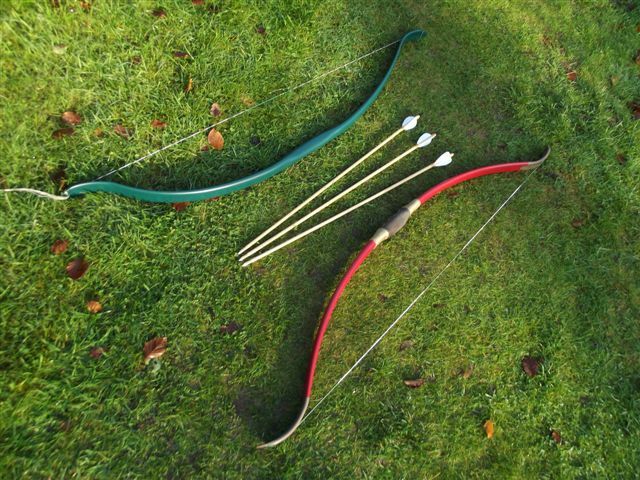 I can't help thinking, when you complete a few PVC longbows, you should then persuade some Frenchmen to make some PVC 15th century armour and get together on an Astro-turf field for a battle re-enactment. Like a plastic Agincourt! I have been marking the back of the wooden longbows I've made with "This side towards the French" rather than just marking "back"! » Query on pipe fitting..